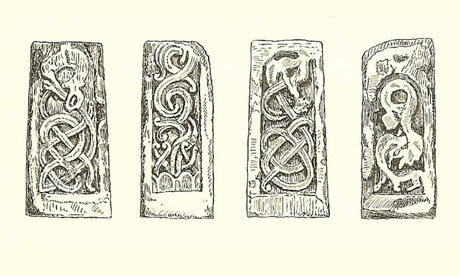 Save the Anglo-Saxon Stone! "So what is it doing in a saleroom?" I have been following the forthcoming sale of antiquities at Bonhams with more than a passing interest. I drew attention to the way that Bonhams had reminded us that some of the archaeological objects would have "interesting" collecting histories. I see that Mike Pitts of the Guardian has an important report ("Antiquities: an ancient cross to bear" / "Save our Anglo-Saxon Stone! ", April 26, 2010) on lot 286, "late Anglo-Saxon stone section of a cross-shaft". It comes from "St Pega's Hermitage in Peakirk, Northamptonshire". Professor Rosemary Cramp, from Durham University, is leading a project to catalogue all surviving Anglo-Saxon stone sculpture. As it happens, she and Joanna Story, a lecturer at the University of Leicester, are in the process of recording Northamptonshire - hence a visit the Evereds recently received from a geologist in Cramp's team. 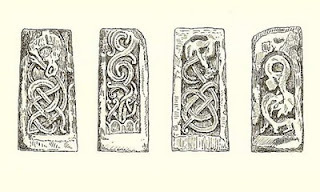 St Pega's cross, says Story, is a typical piece from the important Peterborough school of Anglo-Saxon art, and one of very few sculptures that can be linked to a place whose significance in Anglo-Saxon times is known. Graham Jones, an Oxford University researcher and student of early Christian saints, says the stone is "part of the core historical heritage of the country". So what is it doing in a saleroom - from where it could in theory end up anywhere in the world, and, as academics most fear, disappear from public view? The events of last week have demonstrated that Bonhams is happy to handle controversial pieces. But there is a more important issue here. The present owner now realises the issues and wants to withdraw the cross from the sale - but is reported to be faced with a £9000 plus "consignment fee" if the sale does not proceed. Bonhams needs to seek some goodwill from the archaeological community. So how about waiving the consignment fee so that the present owner can present this historically important cross to the Peterborough Museum? See further comments by Paul Barford.